Here are the presentations and documents from the CLE conference in 2014. If you missed the most recent conference and you want to make sure that you do not miss the next one please register with the Creative Learning Exchange. What Gives System Dynamics Wings? This workshop examines both the practical and philosophical aspects that contribute to a dynamic, learner-centered classroom. We will look at teaching and learning from several points of view, including system skills, pedagogy, and content. Participants will engage in hands-on activities that can be used in a variety of classes and grade levels. No previous experience is necessary, and the session is suitable for classroom teachers, administrators, and other educators. In this fast-paced introductory session, educators will develop their understanding of "systems" by playing with some of the key tools of systems thinking, system dynamics, and organizational learning. Explore how Behavior-over-Time Graphs, Iceberg Models, Stock Flow Diagrams, Causal Loop Diagrams, the Ladder of Inference, and the Habits of a Systems Thinker can help students and adults better understand complex problems and how participants can incorporate their use in their own school setting. Core and will be replete with examples of actual ST/SD lessons that teachers have used in addressing the standards. Have you ever read an article that was of personal interest and that seemed to contain systems concepts, but you were not quite sure where to start a systems diagram? Sharing or teaching from that article can be interesting and relevant. The Finding Systems, the News to Use seminar targets educators interested in gaining experience with pulling system lessons from everyday articles. Several examples will be used to illustrate the ins and outs of getting started. Participants will be able to recognize when an article contains enough system information and how to begin pulling the information out into a system diagram that can be shared and discussed. Time permitting, we will also work on developing a simple model that simulates from one of our examples. This session will introduce a hypothetical new charter high school (Discovery High School) developed by a coalition of entrepreneurs, educators, and concerned community members and based on the principles of systems thinking, discovery learning, and entrepreneurship. Discovery High School will prepare students to live and work successfully by using a system dynamics approach to build a personal narrative as students learn by creating. Upon graduation, students will have the entrepreneurial skills to write code, create a product, and prepare it for their market. The co-founder of this new high school is the CEO of an educational simulation company and will facilitate the session, engaging the participants in a review of the case study, facilitating inquiry and debate of the strengths and obstacles to this creative challenge. An example of some of the concepts discussed at the conference. The heart of the Changing the Game initiative in Milton is the focus on the culture and process created to address a Community Literacy Initiative over the past few years. 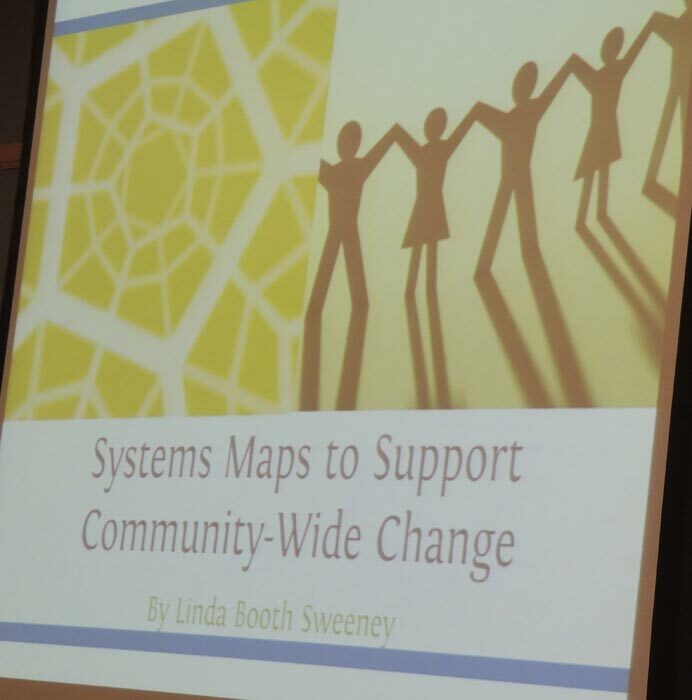 Using specific systems tools and strategies, the leadership has been helping the larger group of stakeholders (including teachers, trainers, parents, Board, and community members) see the big picture, use systems tools, and make decisions for sustainable change that impacts learning and the entire community. In the process, Milton is developing an understanding of the existing mental models that people hold to be true, building partnerships across the community, and, most important—nurturing an openness of mind, heart, and the will to reach their goals to do what is best for their children. Three years ago the Northbridge Superintendent of Schools permitted a teaching team to offer an honors seminar on Systems Thinking. The initial class included second, third and fourth year high school students. The seminar instruction format used three hour time blocks on Saturday. The course involved self-study, discussions, and presentations. Model building using Stella and the use of the Diana Fisher High School Workbook had to be abandoned when the students started to focus on the model building rather than the thinking that could be developed using the modeling ideas. Some students blossomed with this opportunity to look at things in a different way, while some were completely turned off by the potential of failure. The success and failures of this program will be presented along with the conclusion that the most significant failure was that this course was taught too late in the student's educational development. This has led to suggestions of how and when these ideas should be introduced, along with suggestions as to what should be covered, as well as how it should be covered. Innovation Academy Charter School (IACS) is a public school for grades 5-12. IACS includes systems thinking as a founding and continuing principle in the school's charter. In this session, faculty members demonstrate how the school's structure implements their mission and present some recent applications of systems thinking in the curriculum. This session will share an educator's experiences introducing systems thinking and dynamic modeling to pre-service teachers and K-12 students in Indonesia. The session will cover the Educational Design Research (EDR) approach to answer the following question: How can Indonesian students be most effectively engaged in a critical thinking process that allows them to confront the challenges they face everyday? The EDR process involves testing an educational intervention over multiple iterations, documenting its effectiveness, and improving it with each iteration. The presenter hypothesized that introducing systems dynamics would (A) not only be a highly effective way to inject more critical thinking into the Indonesian classroom, but also (B) give students tools that they could begin to use immediately to confront the issues they face every day. This session will first explain the Indonesian societal and classroom context, and then share the model teaching approach and curriculum that was tested to introduce Systems Dynamics to Indonesian students. Results and lessons learned will be shared, and participants can engage with the tested curriculum and give feedback for its improvement. How to teach financial literacy from the two books, Dollars and Sense: Stay in the Black and Dollars and Sense II: Our Interest in Interest. How to understand the impact of demographics on the course of history. This simulation introduces a new project using population demographics and its impact through history. You will be able to give input into this exciting new project. What effects do the values and actions of one generation have on subsequent generations? How do mental models of "need" differ and impact the interactions between human populations and their environment? How does access to innovation or advanced technologies impact system structures and mental models? Participants do not need experience with systems thinking. They will learn as we progress through the simulation. What do playground dynamics, fishing, ecosystems, a hog market, and burnout have in common? For one, it is the ability to explore these systems using easy-to-implement simulations. All you need is an internet connection and you're ready to go. Students from 1st grade through high school ask "What if" questions as they explore the impact of their decisions on the dynamics of a system over days, weeks, or years. Some simulations are even multi-user, allowing the decisions of one student team to impact their results as well as the results of other teams. Each simulation also has free, accompanying lessons and handouts. Quickly build, simulate, and share models. Create models that visualize and build understanding of how complex systems work and things change over time. Based on Systems Thinking and the language of stocks and flows, models created with STELLA® Modeler serve as practice fields to simulate "what-if" scenarios and discover the "why" behind outcomes. This short video is an excerpt from the full Fireside Chat. See the entire video from the chat and other CLE videos at our Vimeo Channel. What Creates a School Culture that Encourages Learning? Smart Cards are a tool to combine low-tech learning from printed, tangible cards and high-tech learning through eLearning modules via a QR(Quick Reader) code placed on each card. The set of cards covers 31 key topics in a Systems Thinking course. Each card offers a definition of a key term, examples and some visuals. In addition, students can use the QR code to access additional material, including a short video, additional text and a short assignment. with the intention for replication and up-scaling in 15 additional schools. In Mauritius, the secondary school system caters to students who are in the 11 – 17 years age group. In this session we discuss a semester-long high school class that uses system thinking tools to analyze the challenges we face in the management of our natural resources. The class is broken into three units: land, air, and sea, with an independent project at the end. We apply connection circles, causal loop diagrams, STELLA computer modeling and online simulators to get a deeper understanding of these systems. 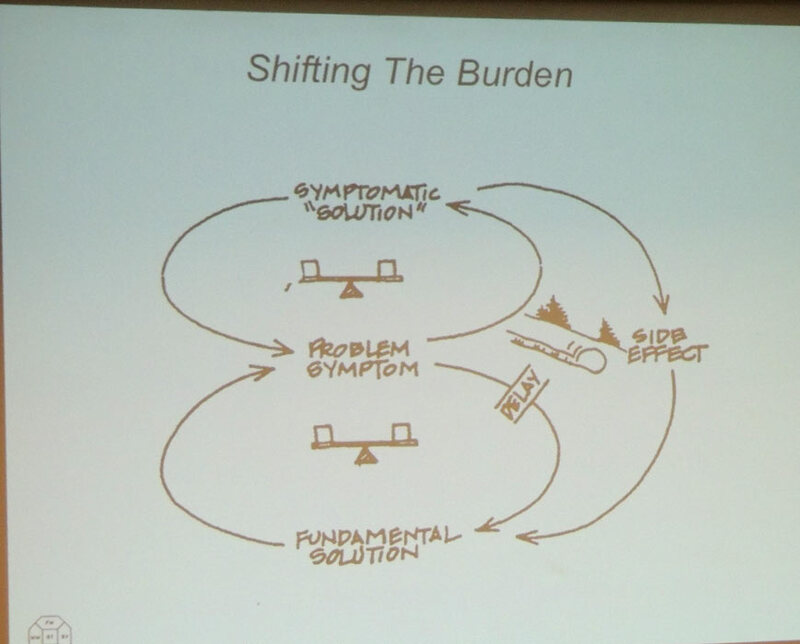 The ideas of sustainability and feedback loops are stressed throughout the class as recurring themes. This session will introduce and showcase the impact of several systems thinking visual tools on the cognitive and emotional development of preschoolers. Participants will experience a two-year journey incorporating ST tools into early childhood classrooms. ST tools shared will include BOTG, Stock-Flow, Casual Loops, Ladder of Inference, and Story Archetype. Examples shared will focus on incorporating ST tools across the curriculum. Resources and take-away examples will be shared, as participants will be encouraged to try these new tools in their own classrooms. Participants will be introduced to the first in a sequence of three online professional development courses, the first of which will be available this summer. The course is 10 weeks long and provides 3 graduate credits (quarter term credits) from Portland State University. The structure of the hands-on system dynamics model building course, some of the lessons, and some of the online instructional videos will be presented. Information about the second and third courses will also be discussed. The first course will also be available in the fall, but the instruction will be spread over 20 weeks instead of 10, to give teachers more time to complete the assignments. The course is appropriate for high school, community college, and undergraduate instructors of math and science.